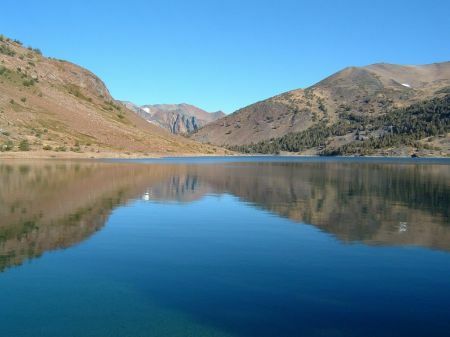 Perhaps for the last time this trout season, Chris and I made a quick trip to the cabin, got some shuteye for about five hours, then headed over Sonora Pass to wind up to the Tioga Pass area about 8:30 a.m. Saturday, Sept. 23. It’s amazing the difference three weeks can make. We first stopped at Saddlebag Lake, where the chill in the air and the cold breeze that would follow us all day bit into our fingers. Our visit earlier in the month wasn’t this cold! I don’t think the temperature rose much about 68°F. Generally, the water level seemed to be almost perfect. New pools to target, but still enough water to allow the fish to move up and down the streams. 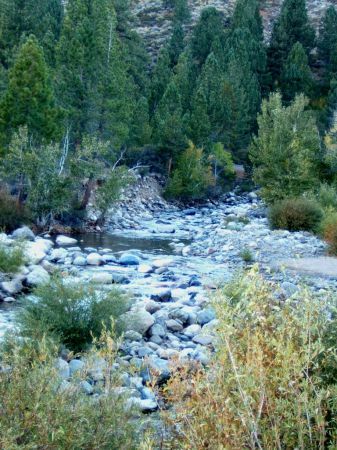 After an hour and a half, we headed over to Lee Vining Creek (South), where we just knew we could find some trout. Sure ‘nuf, skittish brookies were skittering up and down the shallower reaches, where Chris was able to pull in five of the fish with flies (small, as to be expected in the high elevations), but fun nonetheless. I also convinced a brookie to grab a small Panther Martin. We wandered up and down the creek for about four fun hours. 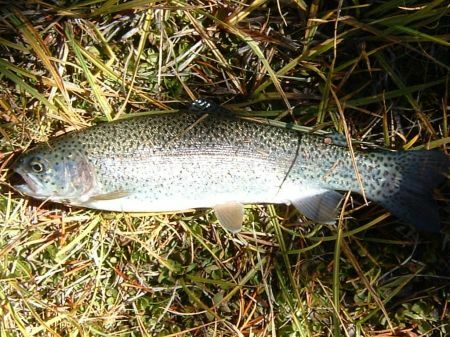 I eventually pulled in two wild rainbows and two stockers, as well as being surprised by another brookie in the bend of the creek just before it heads under the road. Just as important, it was great to be in one of my favorite places. Even my modest lunch seemed to taste better under the clear blue skies. During our descent we stopped at the lower Lee Vining Creek, near Poole Power Plant, but didn’t stick to the more usually fished areas and instead headed upstream a bit. After fighting our way through some bushes, I was rewarded with a heck of a strike in a small pool and Chris got a fish on, but it didn’t want to be landed, and wasn’t. There was just enough time at the end of our day to stop by Pickle Meadows. It was amazing the number of boulders and rocks that have appeared since June. 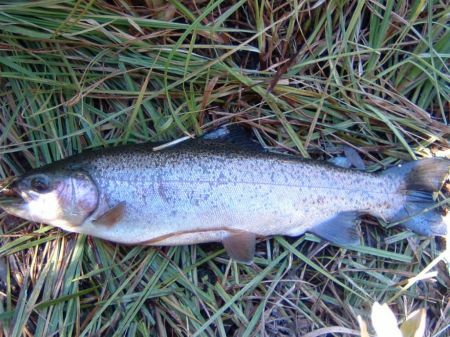 We fished up and down a few spots with the only action being a smallish rainbow that snagged my lure in one of those pools I tend to think holds only water. Always a surprise to get a fish in one of those! In the end, Chris pulled in nine fish; I landed seven. Not bad for a beautiful day in the Sierras! 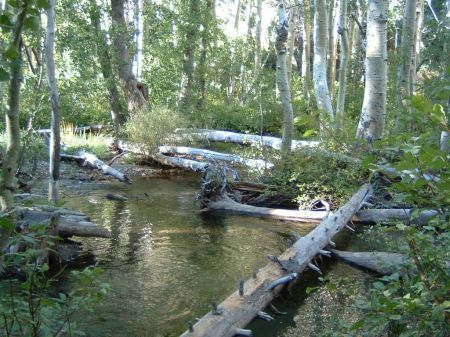 There be fish among those trees on the lower Lee Vining Creek. 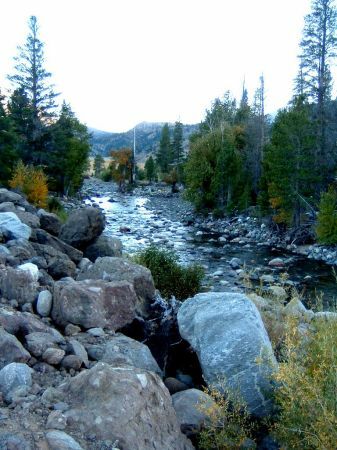 Looking upstream on the West Walker River. Fall on the West Walker River. Sounds like a fun trip. Yes, the fall is settling in. Dana is on his way to California, 1st day yesterday, 9/25, made it to Elkhart, Indiana, 752 miles and had a good day. 2nd day, he’s shooting for making it through Nebraska. Happy fishing, while it lasts. You should include some pictures of you & Chris.